WordPress is one of the most popular CMS available, it is used primarily by bloggers but it can still be used as a general CMS – it is available for free from WordPress. Let me start by listing the pros and cons of WordPress. Fast and easy to installation. 1000’s high quality themes and great plugins. Frequent patching (which can also be a good thing). WordPress is very easy to install – you just edit the included config file, upload the files through FTP then run the installation wizard at your domain name. Once you’ve done those three steps you can log in and start writing content. The only difficulty within the installation is that you must rename the config file from wp-config-sample.php to wp-config.php before it will install. The default theme provided with WordPress is replaced every year by something new. It is valid XHTML and CSS and is a very simple and general theme so can be suitable for many types of website. The only major problem with this theme is that since it’s the default WordPress theme, it is already being used by 1000’s of websites; if you use this theme your website will seem generic to many visitors. Read on to find out how to install a more unique theme. You can customize the look of your website or add an extra feature in under one minute. To install a theme or plugin all you have to do is: download a theme or plugin, upload it through FTP then turn it on in the admin panel. Easy! At the WordPress Theme Viewer there are roughly 3000 free themes for you to browse and download for free. They also have 100’s of WordPress plugins which can: improve spam security and improve SEO among many, many, MANY other plugins. If you are looking for a theme of professional quality, you may consider purchasing a Premium WordPress Theme. (good) Relevant page titles are used but are padded with irrelevant information such as “WordPress Demo » Blog Archive » Page title!”. (average) h1 and h2 tags are used quite effectively but the h1 tag is used on the website name rather than the current page title. (bad) By default, meta tags aren’t included but they can easily be added by downloading a plugin. (bad) By default, the URLs are dynamic such as “/wordpress/?p=1” – the ID number is meaningless and not useful to search engines. WordPress does offer a permalinks utility within the admin panel so you could change that URL to “/wordpress/page-title/” within seconds. Note: The SEO provided by WordPress is below average but can easily be improved by installing one of their many useful plugins. Creating new content in WordPress is very easy with their visual text editor (displayed to the left) or their code based text editor. You simply write a title, write the text then choose a category to add it to and then the content instantly appears on your website. One awesome feature in the visual text editor is an inbuilt spell checker which not only picks up spelling and grammatical errors but also gives recommendations to fix the errors. There are two main interactive features offered by WordPress; users can comment on the content and you can allow multiple authors for the website. User comments can improve your search engine traffic and make your website more interesting in general. If you’re not interested in user commenting, it can easily be turned off. 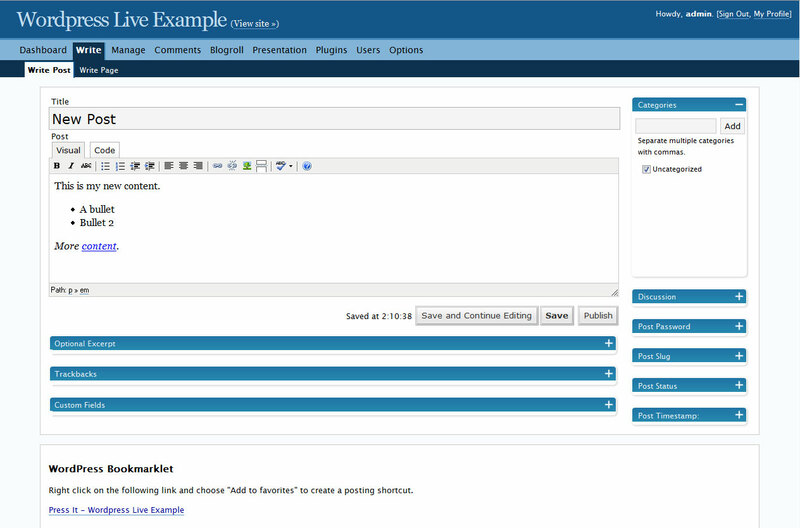 Additional authors can be added easily through the user management section of the admin panel. It a user is listed as an author they have access to a limited admin panel where they can write and edit content. Security from hackers: WordPress is generally very secure but being so popular, people do find exploits once in a while. As long as you keep up with the latest patches (version numbers) you’ll be secure enough – to keep up to date I recommend signing up to their release notification mailing list. Security from spam: The commenting feature included within WordPress is appreciated by visitors but also attracts spambots. To avoid spam within your comments you can download the Akismet anti-spam plugin or use the WordPress comment moderation options. WordPress is one of the most popular CMS available and it gained its popularity for a reason – it’s a great CMS (and it’s free)! While some aspects are not perfect such as SEO, they can surely be improved by a plugin developed by their huge user base. ← How to design a horizontal Web 2.0 navigation bar?